Not to be confused with Speaker of the Dead. Speaker for the Dead is a 1986 science fiction novel by American writer Orson Scott Card, an indirect sequel to the novel Ender's Game. The book takes place around the year 5270, some 3,000 years after the events in Ender's Game. However, because of relativistic space travel at near light speed, Ender himself is only about 35 years old. Like Ender's Game, the book won the Nebula Award in 1986 and the Hugo Award in 1987. 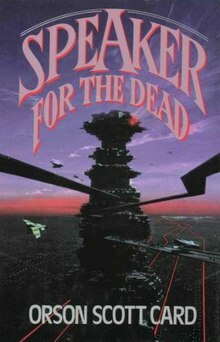 Speaker for the Dead was published in a slightly revised edition in 1991. It was followed by Xenocide and Children of the Mind. Following the xenocide of the Formic species by his own hand (in Ender's Game) as commander of the human spacefleet, Ender Wiggin writes a book under the pseudonym "Speaker for the Dead" called The Hive Queen, describing the life of the Formics as described to him by the dormant Formic queen which he secretly carries. As humanity uses light-speed travel to establish new colonies, Ender quietly travels with them along with his sister Valentine to find a home for the Formic Queen to restart her species. Ender's older brother, the aged Hegemon Peter Wiggin, recognizes Ender's writings in The Hive Queen, and requests Ender write for him once he dies. Ender agrees, and authors The Hegemon. These two books create a new religious movement for Speakers for the Dead who have full authority to investigate a person and their work after their death, and speak without judgement about the essence of them and their life in eulogy. Some three thousand years after the formic xenocide, a human colony is established on the planet Lusitania. The planet is home to a sentient species of mammalian forest dwellers that largely resemble pigs. The colonists (who primarily speak Portuguese) dub them "Pequeninos" (Portuguese for little ones) but they are often referred to as "the piggies" due to their physical resemblance to earth swine. The Pequeninos prove to be of great interest to xenobiologists and due to the fact that humans had previously wiped out the only sentient species they'd encountered (the formics), special care is taken to ensure no similar mistakes are made with the Pequeninos. The colony is strictly regulated to allow only limited contact with the Pequeninos to those xenobiologists, and to not share human technology with them. However, shortly after the colony's founding, many of the colonists die from the Descolada virus before a cure is found. Xenologer Pipo and his son Libo raise Novinha whose parents died from Descolada. Pipo has developed a friendship with the Pequeninos, finding that it is a matriarchal society with the females segregated from the males, and that their belief system centers around the trees of the forests. Pipo finds one of the males dead, his body eviscerated and a sapling planted within the body, believing this to be their funeral rites. Meanwhile, Novinha discovers that every lifeform on Lusitania carries the Descolada virus, and while lethal to humans, appears to serve a beneficial purpose to native lifeforms. When Pipo learns of this, he suddenly has an insight, and before he tells the others, races off to talk to the Pequeninos. Pipo's body is later found cut open, but no sapling planted within the body. As Pipo's death appears unprovoked, the Pequeninos are now considered a threat by the Starways Congress and a fence is erected to protect the colony, with access strictly regulated. Novinha, having fallen in love with Libo but fearing that he will find out from Pipo's files what led to his death, marries another colonist, Marcos Ribeira, so as to lock her files from being opened, under colony law. Emotionally driven, she then makes a call for a Speaker for the Dead for Pipo. Ender responds to Novinha's call, and as Valentine is pregnant with her child, he decides to travel alone save for an artificial intelligence named Jane that appears to live in the ansible network that enables faster-than-light communications. After relativistic travel, Ender arrives at Lusitania 22 years later, finding that Novinha had canceled her request for a Speaker, but in the intervening time, not only has Libo also died in a similar manner to Pipo, Marcos recently died, and Novinha's children, Ela and Miro, have requested a Speaker for Libo and Marcos. Ender, gaining access to all of the appropriate files, learns of tension since Pipo's death; Novinha has turned away from xenobiology to study crop growth, which created a loveless relationship with Marcos, while Miro has secretly worked with Ouanda to continue to study the Pequeninos, while sharing human technology and knowledge with them. Over the course of time, Miro and Ouanda have fallen in love. With Ender's arrival, Miro tells him that one of the Pequeninos, Human, has taken a great interest in Ender, and Ender becomes aware that Human can hear messages from the Formic Hive Queen. Ender and Jane discover that Marcos was infertile: all six of Novinha's children, including Miro, were fathered by Libo, who is also Ouanda's father. Ender also learns what Pipo had seen in Novinha's data. As word of Miro's and Ouanda's illegal sharing of human technology with the Pequeninos is reported to Congress, Ender secretly goes to meet with the Pequeninos. They know his true identity, and they implore him to help them be part of humanity, while the Formic Queen tells Ender that Lusitania would be an ideal place to restart the hive, as her race can help guide the Pequeninos. By the time Ender returns to the colony, Congress has ordered Miro and Ouanda to be sent off-planet for penal action and the colony to be disbanded. Ender delivers his eulogy for Marcos, revealing Novinha's infidelity. Miro, distraught at the implications for his relationship with Ouanda, attempts to escape to hide with the Pequeninos, but he suffers neurological damage as he tries to cross the fence. Ender reveals to the colony what he discovered that Pipo had learned: that every life form on Lusitania is paired with another through the Descolada virus, so that the death of one births the other, and in the case of the Pequeninos, they become trees when they die. Libo and Pipo learned of this, but their deaths were a respectful misunderstanding by the Pequeninos. The colony leaders recognize Ender's words, and they agree to rebel against Congress, severing their ansible connection and deactivating the fence, allowing Ender, Ouanda, and Ela to go with Human to speak to the Pequenino wives, to help establish a case to present to Congress. The Pequenino wives help Ender to corroborate the complex life cycle of the Pequeninos, affirming that the death ritual Pipo observed was to help create "fathertrees" who fertilize the Pequenino females to continue their race. The Pequeninos believed they were honoring Pipo, and later Libo, by helping them become fathertrees, but Ender explains that humans lack this "third life", and if the Pequeninos are to cohabitate with humans, they must respect this difference. To affirm their understanding, Human allows Ender to perform the ritual of "killing" him to take him into his "third life" as a fathertree, providing Ouanda with the confirmation needed to present to Congress. Miro recovers from most of the physical damage from his encounter with the fence, but he is still paralytic. Valentine and her family inform Ender they plan to help Lusitania with the revolt, and they are traveling to help; Ender has Miro meet them halfway. Novinha, having gained understanding into the death of Pipo and Libo, finally absolves herself of her guilt, and she and Ender marry. Ender plants the Hive Queen as per her request, and he writes his third book, a biography of the life of the Pequenino, Human. At the Los Angeles Times Book Festival (April 20, 2013), Card stated why he does not want Speaker for the Dead made into a film: "Speaker for the Dead is unfilmable," Card said in response to a question from the audience. "It consists of talking heads, interrupted by moments of excruciating and unwatchable violence. Now, I admit, there's plenty of unwatchable violence in film, but never attached to my name. Speaker for the Dead, I don't want it to be filmed. I can't imagine it being filmed." Card writes in his introduction to the 1991 edition that he has received letters from readers who have conducted "Speakings" at funerals. ^ a b "1986 Award Winners & Nominees". Worlds Without End. Retrieved 2009-07-15. ^ a b c d "1987 Award Winners & Nominees". Worlds Without End. Retrieved 2009-07-15. ^ Bloomekatz, Ari (April 20, 2013). "Orson Scott Card talks film, adaptation of 'Ender's Game'". Los Angeles Times. ^ Card, Orson Scott (1991). Speaker for the Dead, Revised Edition. New York: Tor. p. x. This page was last edited on 28 December 2018, at 16:46 (UTC).